an "Earth Care Congregation", which was originally certified in 2015 and must be renewed annually. with the Presbyterian Church (USA). a member of PA Interfaith Power & Light. 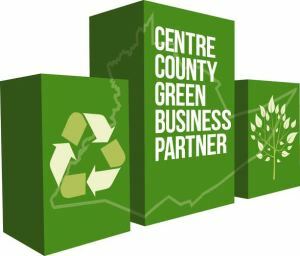 a Centre County Green Business Partner by the Centre County Recycling & Refuse Authority, The Centre Region Council of Governments & State College Borough. The SCPC Sustainability Circle, our Green Team, includes folks from the congregation that meet (almost) monthly to ensure we are doing our best to be an earth loving building and people. If you are interested in joining us in this important work, contact Liane Roe. We'd love to have you come check it out to see if you feel called to serve on this great team. What resources does it take to support your lifestyle? Complete an online quiz to find out your Ecological Footprint, discover your biggest areas of resource consumption, and learn what you can do to tread more lightly on the earth. Centre County Recycling & Refuse offers numerous ways to recycle. Learn more about making your home greener and greener each day, in the ways you REDUCE first, and RECYCLE those things you are able. Celebrate Advent in thoughtful and simpler ways, so that your giving and celebrating offers goodness to God's creation. Great ideas here. Clean Energy Options is a clean wind and solar energy choice. You can check out the web site at www.cleanenergyoption.com or call at (888) 985-2612. Imagine the conversation The Creator might have had with St. Francis on the subject of lawns. Now click here to "hear" it. Typically, when many homes are built, the shrubs and trees are chosen for a neat appearance and minimum maintenance. However, they often quickly outgrow their spaces, and do not provide much to sustain the other members of God’s creation in terms of food and habitat. What can you do? Plant Spring-blooming bulbs to add color to your landscape and provide nectar for pollinators emerging from a long winter’s sleep. Those altar flowers you took home can be planted in your home garden, and in the case of Easter lilies, may die back and rebloom in August! Consider planting tree and shrubs which both you and animals will enjoy. Juneberry and Nanking Cherry are small trees with white blossoms in early May and tasty berries in June. Raspberries and currants make for good fresh eating as well as sauces and preserves. Strawberries, famous in those June Church socials, also make a great groundcover and can suppress weeds. Crabapples, also with showy blooms, have fruit that persists through the winter, which birds can enjoy in the Spring as well. Many fruit trees are beautiful in the home landscape, and though they take a little more care, are well worth the effort.